As a celebration of Spring we have created Yorkshire Salad. 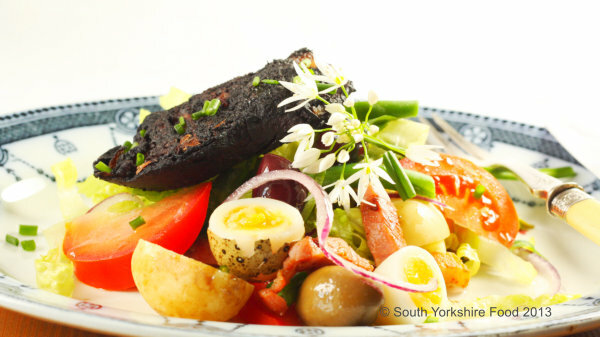 It is a Yorkshire variation of the famous Salad Nicoise and it incorporates typical Yorkshire ingredients, black pudding, and gammon. 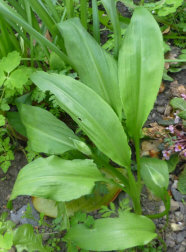 It is further enhanced with the flavour of Ransom, or wild garlic, as it is more commonly known. The Ransom imparts a subtle garlic flavour to the salad. A light, tasty, and satisfying lunch dish. This recipe was created jointly with guest chef Brian Barnes - nice one Brian! Serves 2. First sauté the gammon lardons in the oil until crisp. Set aside in a bowl to cool. Next add the slices of black pudding to the sauté pan and fry until they are crisp on the outside. Set aside. Drain the beans and asparagus tips and dry on kitchen paper. Peel the quails eggs, but leave some in with half the shell. Now carefully slice each egg in half. Now add all the salad ingredients, apart from the black pudding, to a bowl and gently toss the salad to mix it up. Put all the dressing ingredients into a screw top jar, and shake well to mix it up. Add the required amount of dressing to the salad and gently toss to coat all over. Divide the salad between two plates, and arrange the presentation artistically. Top with crispy slices of black pudding, and garnish with a Ransom flower.